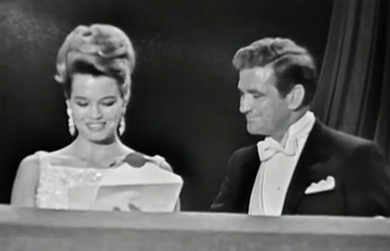 Rod Taylor teamed with actress Angie Dickinson as a presenter on the 34th Academy Awards show, April 9, 1962. 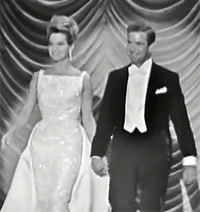 The ceremonies were held in the Santa Monica Civic Auditorium and aired on ABC. 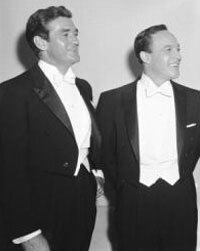 Bob Hope was the host. 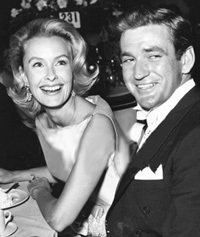 In his introductions of the presenters, Hope said, "To present the Oscar for film editing, here are two extremely well-edited young players who have recently returned from filming in Italy: Miss Angie Dickinson and Mr. Rod Taylor." Their repartee at the podium included a nod to Rod's TV show "Hong Kong." Rod: Angie, I wonder why Hope never made a picture in Europe. Angie: But he did, Rod. In London he just finished "The Road to Hong Kong." Rod: Oh, well, he just better keep away from that road, it's kind of trouble. I seem to remember having been there. Angie: William H. Reynolds for "Fanny"
Rod: Alan Osbiston for "The Guns of Navarone"
Angie: Frederic Knudtson for "Judgment at Nuremberg"
Rod: Philip W. Anderson for "The Parent Trap"
Angie: Thomas Stanford for "West Side Story"
Rod: And the winner, Angie? Angie: The winner is ... Thomas Stanford for "West Side Story." 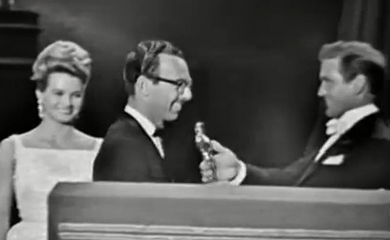 Stanford's Oscar for film editing was one of 10 Academy Awards won by the acclaimed musical.